I bike home from work at night. At intersections, I look at the vehicles to confirm they are not going to run me over. It’s never as certain as I’d like. Until I started wearing the Lumos Helmet. 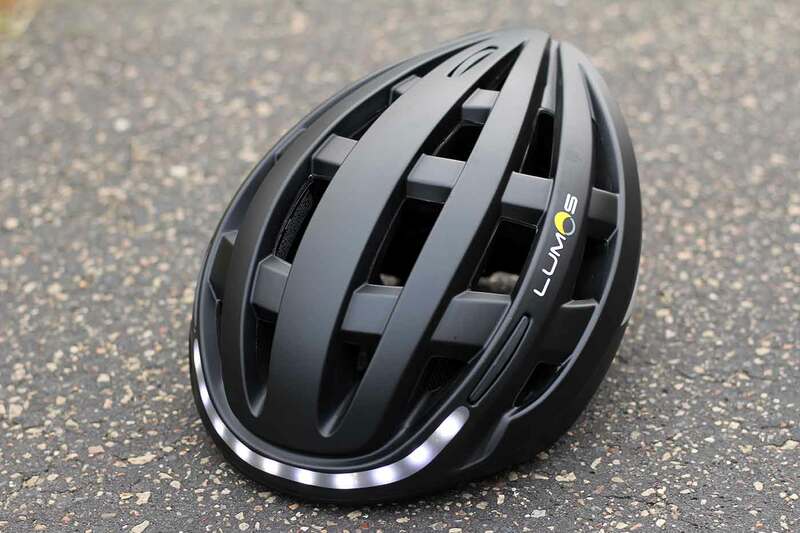 With bright-white LED lights in front and red LEDs in back, the Lumos Helmet gives cyclists superior visibility. It has turn signals with a handlebar-mounted Bluetooth control and retails for $179. From winter into spring, I wore the Lumos Helmet for my daily commute. 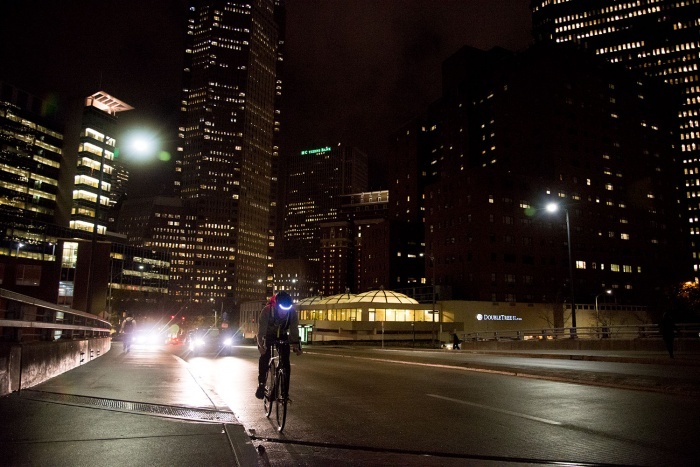 It’s now my go-to for riding at night—so much so I feel concerned and anxious without it. Before the Lumos, I had two lights fixed onto my bike’s frame. White and red strobes sent signals to motorists, or so I hoped. Then I added the Lumos helmet and it really sent a message. Cars noticed me. Stopped at red lights, people inquired through their windows about it. Cyclists wanted one. It’s that obvious. The Lumos has a rechargeable battery and takes about two hours to charge. It will last several night-time rides and on average, I’ve charged it every one-to-two weeks. The straps clip under the chin and the helmet is a little uncomfortable, unfortunately. The plastic on the helmet around the rim of my head is slightly rough, and the side adjustment straps slide around every once and awhile. I got used to it, but switching to my other bike helmets I immediately noticed the difference in comfort. While not perfect, this is a minor flaw for normal commuting distances. I would not recommend the helmet to people going on long rides exceeding an hour. At $179, it may seem expensive. 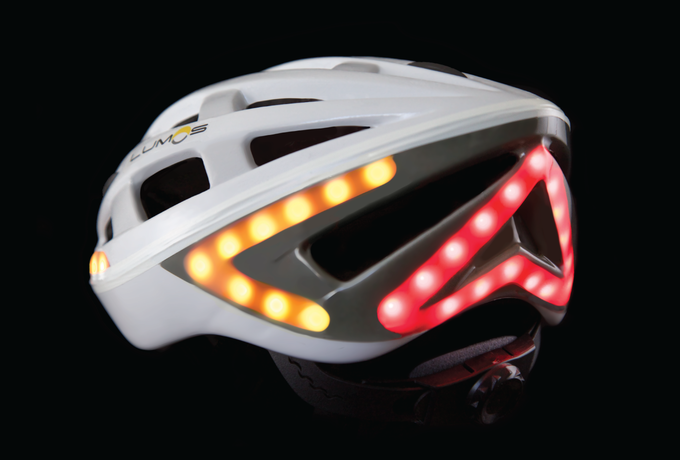 However, a bike helmet and quality set of lights can easily cost that much, if not more. It weighs 15.5 ounces and charges via a magnetic USB cable. One button on the back of the helmet controls the modes. The helmet has a strobe, fast strobe, and continuous-shine settings for front and back. There are 60 LED lights in front and back that shine up to 80 lumens. 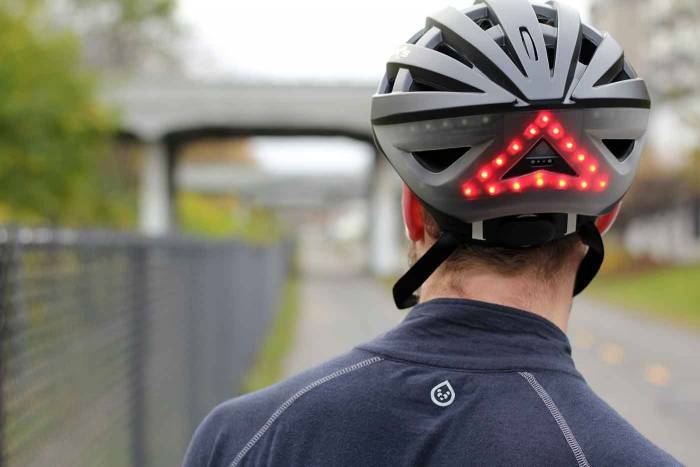 The helmet has two additional safety features that users can set up if they want. With a free app, you can pair the helmet to your phone. This controls the automatic brake light on the back of the helmet. The helmet sense when you’re decelerating and brightens the rear LEDs. Lumos also comes with handlebar-mounted turn-signal buttons. Pairing these with the helmet is easy and takes about a minute. Once complete, orange arrows on the back, and the left or right half of the front lights blink when you press either signal. The issue you seem to have might be because you are accidentally entering “pairing mode” on the helmet each time you turn it on. A lot of people are doing this – we’re gonna be changing how to enter “pairing mode” moving forward soon. The brand noted resolving the issue was simply to press the helmet’s ON button once, briefly, instead of holding it down. We tried this and confirmed it works. The Lumos recently fulfilled its crowdfunding campaign and will ship in June 2017. Pre-orders are available to place now. Bike safety is no joke. Cyclists get hit and injured all the time or worse. I like to say the more visibility the better, and the Lumos helmet fits that bill. While the Lumos won’t guarantee a safe ride, it’s one way to really make yourself stick out. Plus, it doesn’t require any extra effort aside from strapping up your helmet as usual.